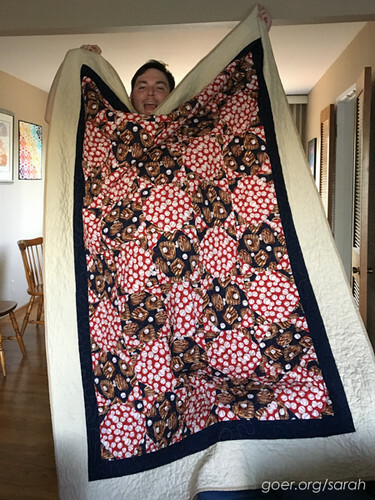 Yesterday, about seven hours before my brother arrived for his birthday dinner, I finished his quilt. I finished his quilt that I started for him in 2004. Let's just take a second to put that in perspective. That was before I lived in this house. In fact, it was two homes ago. It was before I had kids. It was before I was married. It was before I had even met my husband. Yeah, basically, I was a completely different person back then. 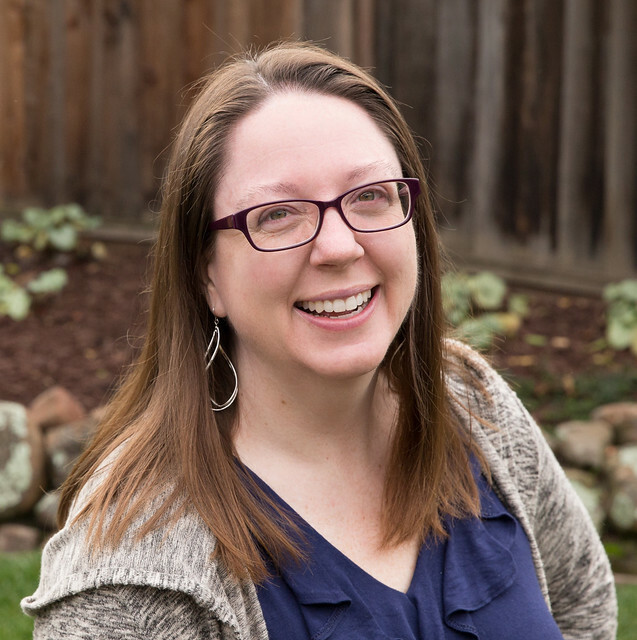 The single, middle school math teacher, who really didn't have much time for her newish quilting hobby. 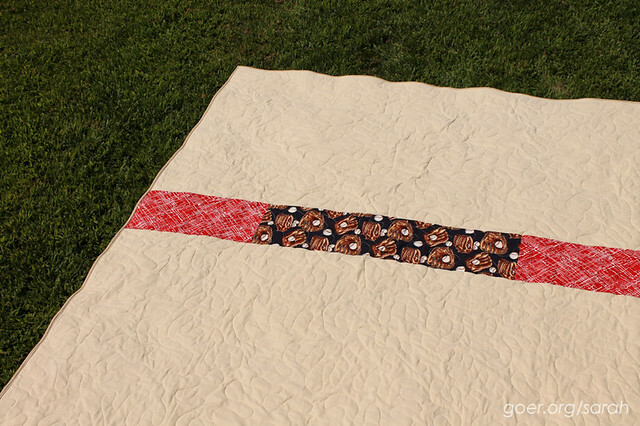 Oh, and by the way, I actually gave my brother this quilt as a Christmas present in 2004 (photo above). I think that was his Junior year of high school. I wrapped up about eight finished blocks for his gift and then "was going to finish it up for him." See, he even tried them on. And fake slept. ;-) Well, here we are, twelve years later. I know there are people with WIPs older than mine, but come on. They are snowball blocks. 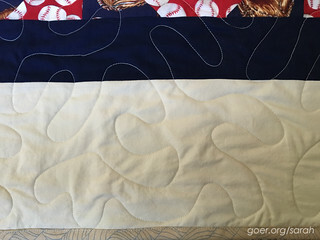 I've completed over 40 quilts (granted, many of them mini quilts) since I started his. Sheesh! The back is simple. 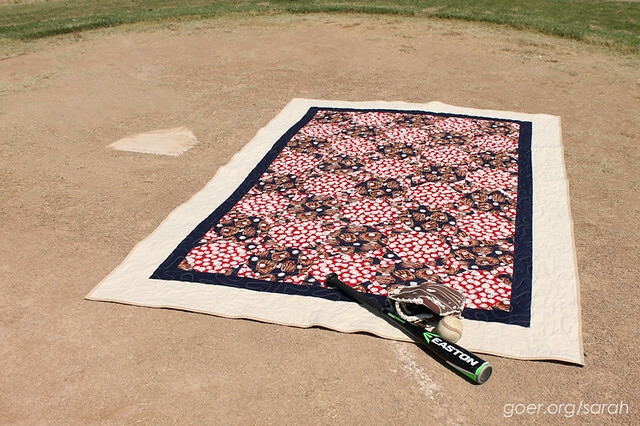 I used up the last of my baseball mitt fabric. 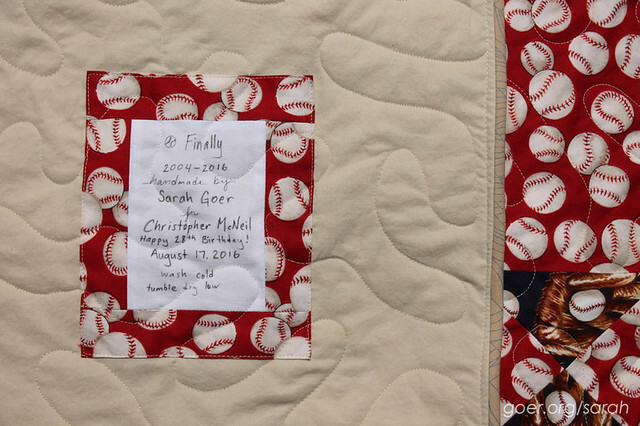 (The last of the red baseball fabric went on the back of my daughter's first quilt.) and I snuck in some of the red fabric that I used when I made my kids' baseball clothes. 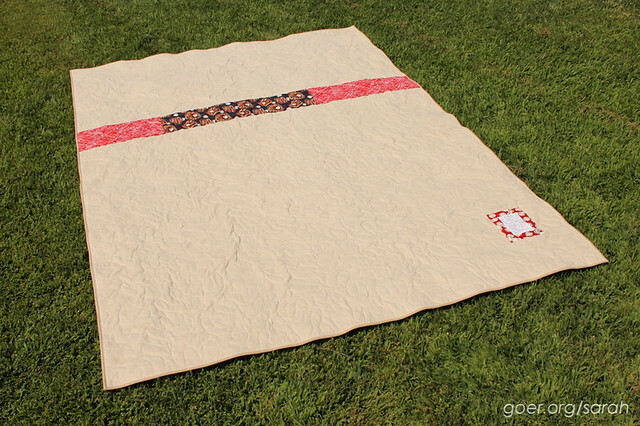 Here's the 58" x 83" quilt all washed and crinkly, just in time to give to Chris. 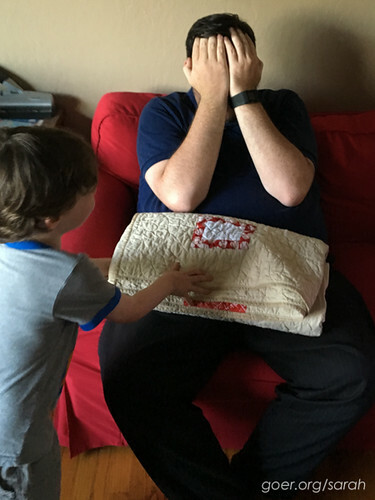 My son excitedly helped deliver the gift. I'm linking up to the Q3 Finish Along finishes party. See all my Q3 WIPs in my goal post. 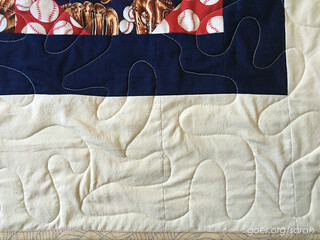 ALYoF July Goal: My Oldest WIP Snowball Baseball Blocks 2015 Quilting and Sewing Goals Purple Ninja Quilt, Finished at Last! Posted in Quilting. 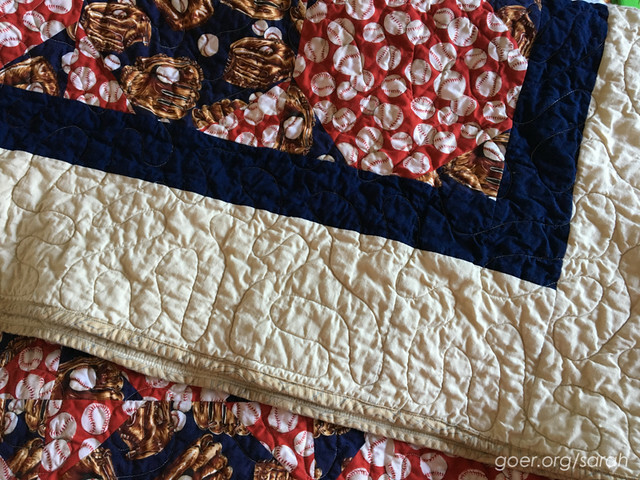 Tags: Finally, finished quilt, gift quilt, lap quilt on August 18, 2016 by sarah. 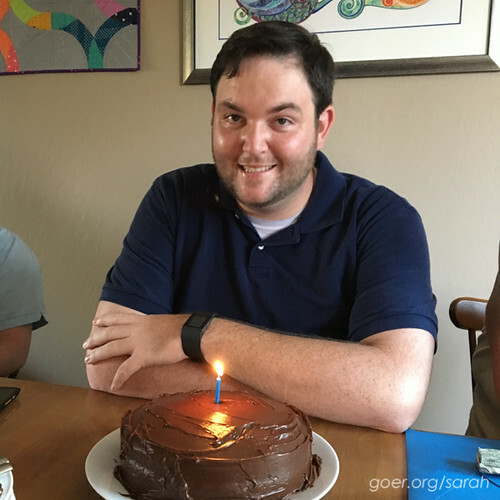 Aw, this was such a great post! I chuckled about the quilting definitions. Does he LOVE it?? Love it! What a lucky brother! You did it! Hooray! All the good feelings in the world are yours right now! Except for your brother - he can feel good too. You did it!! Yea!! Was your brother surprised? 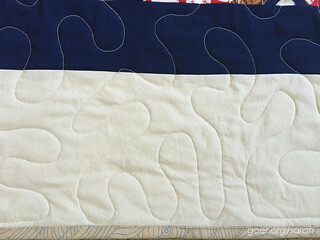 Quilt looks great!! I had him try on the quilt top (before it was quilted) a while back... so I think he was expecting it. Aww, thank you, Sangeetha. I owe you an email! I hope you're well. Being a baseball fan, I am thrilled that Finally (great name!) is done and gifted to your brother. I hope some good baseball vibes head to San Francisco and the Giants FINALLY start winning again! 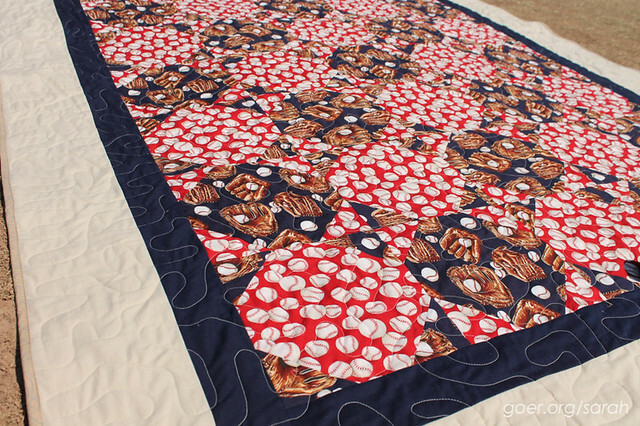 So fun to read about this quilt's history and journey, and the pics of the different baseball players in your meandering quilting made my day! Thank you, Mary! I'm so glad to have finished it time for his birthday. 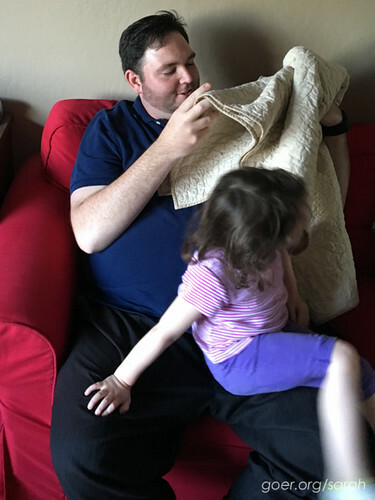 It's shocking but this is the first quilt I've given my brother. Glad you enjoyed the story! What fun and what a patient, sweet brother you have. I really enjoyed this story, Sarah. Thanks for telling it. Besides being delightful, it gives me hope that I can finish some long-overdue projects, too. All is not lost. A great finish to a very fun story. I have read about this WIP before. I bet you are so glad to check this off the list. 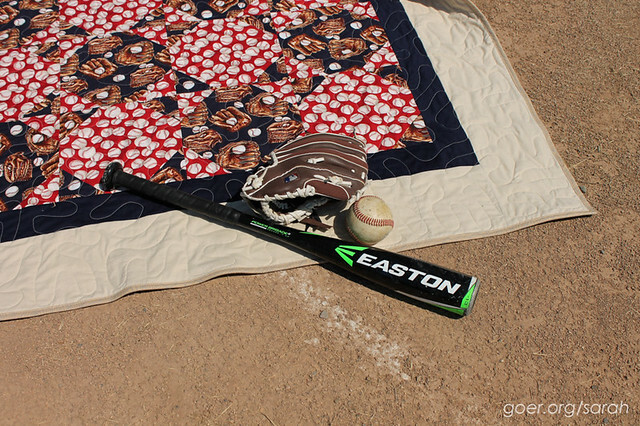 Your brother will enjoy it and you can breathe a sigh of relief. :-) Good finish and I enjoyed hearing about your son's conversation. What a cutie. Yep, you've seen this one again and again on the blog. I am happy to have kicked it into the done column. Just got back from a weekend camping and the kids start school this week. I need to take some time to think about what I want to focus on. 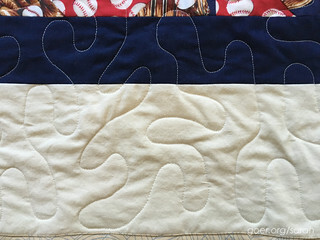 I have a couple mini swaps and some challenge quilts I'd like to work on. But there are a lot of WIPs I'm hot to make progress on as well. Just not enough hours in the day! Thanks for visiting, Bernie! Thank you so much, Nicky! It was a huge weight lifted to have my oldest WIP done and out of the way! It is beautifully complete !!! Indeed, Marji. Thanks for visiting!